The WHO-Civil Society Task Team was established in January 2018 at the invitation of WHO Director-General, Dr. Tedros Adhanom Ghebreyesus, with the goal of building a set of bold, creative recommendations for enhancing collaboration between WHO and civil society organizations (CSOs) to help achieve the “Triple Billion” goals outlined in WHO’s 13th General Programme of Work. The recommendations outlined below are the result of a six-month consultative process led by this globally representative Task Team. 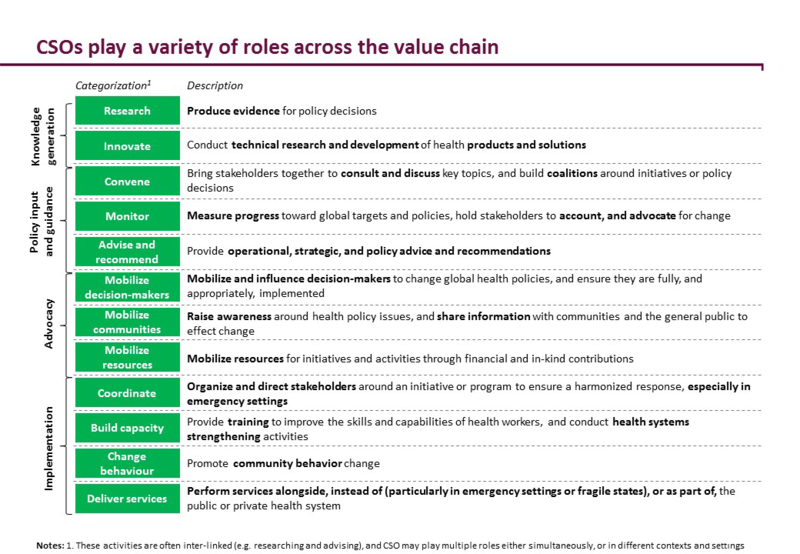 They lay out a set of concrete actions that WHO, CSOs, and Member States can take to strengthen engagement at all levels – global, regional, and country – to improve health outcomes worldwide. Policy dialogue: Build in explicit, accessible opportunities for civil society to provide input into policies and governance at all levels. At the country level, the Task Team recommends that WHO encourage Member States to consult CSOs in the development of the Country Cooperation Strategy (CCS) and that WHO work with CSOs to create time-bound national roadmaps to complement the CCS, detailing how WHO and CSOs will engage in the following strategy cycle. At the global and regional levels, the Task Team recommends that WHO take steps to strengthen the roles for civil society in governance and policymaking through increased meaningful CSO engagement. Health emergencies: Strengthen emergency response by expanding country-level tripartite Health Cluster leadership. The Task Team recommends that WHO expand the current WHO-Ministry of Health leadership of national Health Clusters to a tripartite arrangement that includes a CSO as co-lead, as recommended by the IASC Reference Module on Cluster Coordination and as contextually appropriate. The Task Team recommends that WHO establish an Inclusivity Advisory and Oversight Group (IAOG) to support the Director-General, Senior Advisor on Youth and Gender, and the Executive Board to develop and evaluate policies and to provide formal support on gender, youth, equity, and rights mainstreaming. This group should be as diverse as possible, with representation from affected communities, faith-based organizations, and marginalized populations such as women, youth, indigenous groups, and people living with disabilities. Data, research, and innovation: Develop a platform to crowdsource complementary, disaggregated data from CSOs. Working with WHO and a third-party technology provider, the Task Team recommends that CSOs set up a data collection platform to collate disaggregated data (e.g. burden, coverage, and uptake data disaggregated by gender, age, race, ethnicity, and socioeconomic status), from across the CSO landscape, including community-based groups in particular, to complement existing sources. Establish incentive mechanisms and build staff capacity to promote strengthened CSO engagement. The Task Team recommends that WHO develop a Monitoring & Evaluation framework with Key Performance Indicators to measure staff or departmental engagement with CSOs (e.g. frequency, directionality, representation), and to monitor whether, and how well, CSOs are consulted in the creation of policies and programs. To help staff deliver on this, WHO should expand the capabilities of country offices to include stakeholder engagement skills and run community engagement trainings. Launch an online platform to track and share collaboration with a wide range of CSOs. The Task Team recommends that the WHO External Relations department develop and regularly update an online platform. The platform would build on the existing registry of non-State actors (NSAs) to include the full range of relevant CSOs (health and non-health, global, national, and local). The platform could also outline the full range of opportunities (ongoing and ad hoc) for WHO-CSO engagement at all levels, as well as instructions for how CSOs can participate in these opportunities. 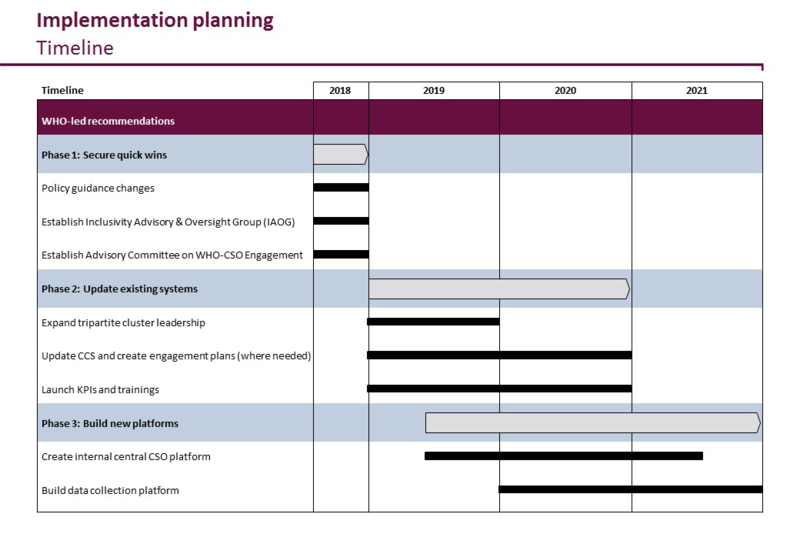 The Task Team recommends that WHO create an “Advisory Committee on WHO-CSO Engagement” charged with supporting, monitoring, and reporting on WHO’s CSO engagement transformation in the long term. This Committee should develop its own, independent annual assessment of progress on WHO-CSO engagement. Articulate and advocate the added value of civil society to WHO and Member States, and proactively participate in policy creation and national roadmap development. The Task Team recommends that CSOs work together through existing CSO platforms and leverage individual relationships to communicate the full breadth of values they bring and their commitment to shared goals, encouraging WHO and Member States to proactively engage CSOs. CSOs should actively participate in, and be jointly responsible for, WHO-CSO engagement training and the creation of national roadmaps. Increase organization and coordination among CSOs, particularly within countries. While recognizing the strength of the diversity across the CSO landscape, the Task Team recommends that CSOs use existing mechanisms (including UHC2030, the Partnership for Maternal, Newborn & Child Health, Global Fund Country Coordinating Mechanisms, and Gavi CSO platforms) and broader health platforms, where possible, to aggregate input, liaise with WHO, and distribute CSO engagement opportunities. Create space for WHO to deliver on its commitments under the Framework of Engagement with Non-State Actors (FENSA), and hold WHO to account. The Task Team recommends that Member States uphold their commitment under FENSA, and allow, and encourage, WHO to independently pursue partnerships with CSOs through FENSA. Uphold past World Health Assembly (WHA) resolutions by recognizing the diverse role and value of CSOs and inviting civil society into its own planning and policy processes. Multiple WHA resolutions, most notably from WHA 69 and 70, recognize the valuable role CSOs play. To uphold these resolutions, the Task Team recommends that Member States proactively engage CSOs operating in their country to understand their objectives and activities and identify opportunities for collaboration and mutual support, particularly in policy and strategy setting processes. • WHAT IS THE WHO-CSO TASK TEAM? In September 2017, WHO Director-General Dr. Tedros Adhanom Ghebreyesus requested that the United Nations Foundation and RESULTS create a working group to explore strategies for improving engagement between WHO and civil society organizations (CSOs). The WHO-CSO Task Team has 21 members from 17 countries, representing a range of sectors, geographic regions, functions, and levels of engagement with WHO. It was established in January 2018 and has been co-facilitated by the UN Foundation and RESULTS. • WHAT IS THE “TRIPLE BILLION”? The 13th General Programme of Work (GPW) is WHO’s five-year vision to promote health, keep the world safe, and serve the vulnerable. It was approved by member states at the 71st World Health Assembly in May 2018. The GPW lays out bold commitments to ensure that, by 2023, one billion more people benefit from universal health coverage, one billion more people are protected from health emergencies, and one billion more people are able to enjoy better health and well-being. As the GPW well articulates, WHO must strengthen its collaboration with partners from all parts of the world to harness collective efforts for good and to achieve these ambitious “triple billion” targets. • WHY ENGAGE CIVIL SOCIETY? Civil society is uniquely positioned to represent and reach target populations and help advance universal health coverage, protect the vulnerable, and promote good health and well-being. Ranging from community-based organizations to non-profits and research institutions, CSOs play a variety of roles, such as knowledge generation, policy input and guidance, advocacy, and implementation support, and actively support vulnerable and hard-to-reach populations. • HOW DOES WHO CURRENTLY ENGAGE CIVIL SOCIETY? WHO’s recently adopted Framework of Engagement with Non-State Actors (FENSA) outlines the principles through which WHO collaborates with CSOs and serves as a basis for enhancing WHO-CSO engagement. It was approved by member states at the 69th World Health Assembly in May 2016. FENSA defines five types of engagement: participation, resources, evidence, advocacy, and technical collaboration. The Task Team agreed that within these principles, there is an opportunity to further define and enhance how WHO and CSOs engage in a way that captures the full diversity of the civil society landscape and defines a strategic approach to collaboration in pursuit of shared goals. • HOW WERE THE WHO-CSO TASK TEAM RECOMMENDATIONS DEVELOPED? CSO survey: A short survey on WHO-CSO collaboration was circulated to a globally diverse sample of over 400 CSOs and made available in English, French, and Spanish. 153 CSOs across WHO regions and levels (global, regional, country) completed the survey. WHO consultations: The Project Team held discussions with WHO Headquarters staff, as well as current and former WHO Representatives in several countries. The emerging recommendations were shared with a wider set of WHO staff for review and feedback. CSO consultations: The Project Team conducted in-depth, individual interviews with each Task Team member, and gathered input from additional CSO representatives where recommended. CSOs were also invited to review and provide feedback on the emerging recommendations over a three-week period, and more than 40 stakeholders responded to an online consultation. WHO-CSO events: The Task Team met for two in-person workshops, the first in February 2018 in Geneva and the second in April 2018 in Washington, DC. Several Task Team members in official relations with WHO hosted an official World Health Assembly side event in May 2018 focused on civil society engagement to achieve the GPW, where the Task Team’s preliminary findings were presented. Review of exemplary mechanisms: The Project Team reviewed existing CSO engagement mechanisms at WHO and other institutions and held additional consultations to inform and guide the recommendations. • WHAT’S NEXT FOR THE TASK TEAM? The Task Team will share these recommendations with key constituencies, including WHO staff, Member States, and a range of CSOs through presentations at WHO Headquarters, and other international conferences in 2019. Over the coming months, members of the Task Team will continue to work on an informal basis to support WHO in the implementation of these recommendations, aligned with the proposed timeline below. To provide remarks, or learn more about how you or your organization can get involved, please leave your information in the comments box below. Please follow along and join the conversation on social media using #CivilSociety4Health.